In case you’re looking out for an effective e-Commerce solution, Magento arrives as the top in the list. No doubt, it’s a feature-rich and flexible e-Commerce solution. It consists of a license-free version known as Community Version. It also includes a few supported versions that arrive with a hefty price. However, if the core of your business is the online store, Magento is worth an investment. This e-commerce solution is built to be scalable and flexible. The e-Commerce consultants from all over tout it as one of the best open source solutions for e-Commerce available in the market. With Fortune 500 Companies and more than 125,000 websites listed under its title, Magento is certainly the best. However, is it the right e-commerce solution for you? Below listed are a few pros and cons which may help you come out of your dilemma and choose better. It is a big community, which is extremely talented and growing very fast. Minimal support for the free CE (Community Edition). But, eBay bought this as its e-commerce solution for their X.commerce suite. It can be said that if the code were anything like stock, a majority of the Magento community would be extremely rich. Sure, it may give a feeling of being over-architected, but it’s powerful enough to meet your every requirement. Magento development has been done with one to a million scale in mind in order to avoid hindrances for developers. Support, Code reuse, debugging, and maintainability is all hefty and expensive issues, which solution providers are required to deal with. Magento simply makes all of these issues feel like a breeze. The out-of-the-box feature set allows Magento to handle concepts in an organized and proper approach. Stock Magento arrives with Digital, Simple, Virtual, Configurable, Grouped and Bundled Products. You can use this platform for selling digital music and amusement park tickets at the same time without the need of any extension. This e-commerce solution has been built like a Java application, although, codebase for this platform is written in PHP. During heavy processes, the application tends to consume a heavy amount of RAM. Often PHP cannot handle this high amount of load no matter how a large amount of hardware is used for it. For instance, Amazon Cloud Services can be used to power the platform yet no amount of servers can overcome the I/O issues coming with PHP. This is alleviated by almighty servers along with caching layers. Simultaneously, Magento uses two-three caching systems. It also creates indices of the massive quantity of data and further compiles it for performance into flattened tables. It’s a complex platform so it can be tough for beginners with the lack of or no technical skills. For being certified, even an experienced and highly qualified developer needs time to learn about this e-Commerce solution. The advancements in technology have offered us with a lot of brilliant resources to utilize. 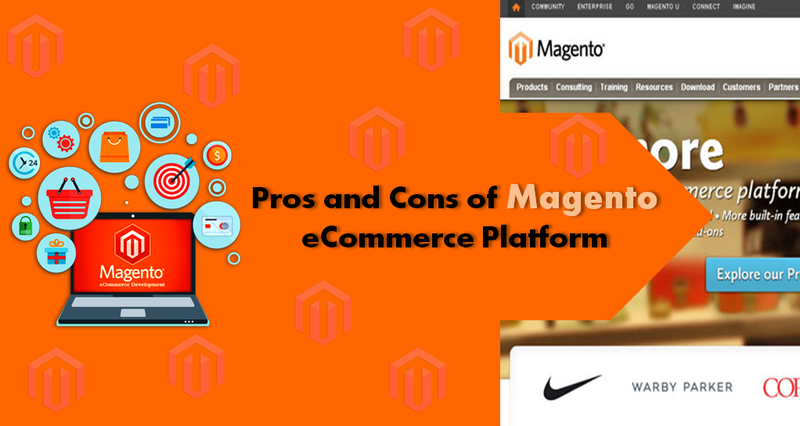 In order to select an e-Commerce solution for your online business, you need to go through pros and cons. If you need more CMS functionality and sell a lesser number of items, you must consider other solutions such as Shopify, Volusion, etc. Magento is the best option for e-Commerce sites having the level of medium to large scale enterprise.